1 - 9 $25.50 ea. 10+ $22.38 ea. 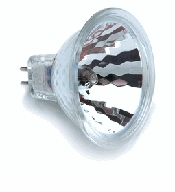 6.6A/30W - MR-16EZA Light Bulb - Airport Lighting - Description: This is a 6.6Amp 30 watt, MR16 airport lighting reflector bulb with a faceted face. The connectors are 2(G5.3 pins). Life is 1000 hours and light output is 11000 lumens nominal at center.